Are Diverse People Similar in More Ways Than Different in the Workplace? Want to develop effective working relationships with diverse people in the workplace? Start with similarities, not differences, among people when you build relationships. Diversity in the workplace adds a special richness but also presents special challenges. You can succeed when you develop a true appreciation for the different races, nationalities, genders, ages, ideas, skills, backgrounds, and different ways of approaching problem solving that diverse people bring to the workplace. As a human resources professional, manager, supervisor, coworker, staff member or business owner, effective diverse workplace relationships are critical to your success. A lot of attention has been focused on emphasizing, honoring, and appreciating the diverse needs, skills, talents, and contributions of people in the workplace. While this is critical, don't let the pendulum swing too far in this direction. Workplaces are in danger of forgetting how to honor and appreciate the similarities each employee brings to the workplace. 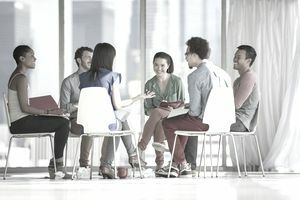 By acknowledging the similarities and likenesses, you can create a starting point for understanding and appreciating diversity in the workplace. A strong example emerges in "The Human Capital Edge: 21 People Management Practices Your Company Must Implement (or Avoid) to Maximize Shareholder Value," by Bruce N. Pfau and Ira T. Kay, executives with Watson Wyatt Worldwide. In Watson Wyatt's WorkUSA research, they asked 7500 workers at all job levels across diverse industries to respond to 130 statements about their workplaces. Watson Wyatt broke down the responses to look for diversity patterns across demographics including whites versus minorities, men versus women, and people over and under 30 years old. They found more similarities than differences, especially in the categories respondents rated as most important to them. People agreed about what inspires their ​commitment to a particular employer. People cited the following factors as important. The company acted on employee suggestions. People also agreed on what organizations need to improve: employee input and promoting the best performers while helping the worst performers get better (or get terminated). In response to the research, Pfau and Key recommend that organizations concentrate on four areas with their employees. Keep your company effective, winning, and on the right track. Employees want to work at a winner. Your company, its products and services, and the environment you provide for employees are all significant facets of this. Help people, supplied with needed resources, use their talents and skills to contribute to the overall accomplishment of the organizational objectives. Respect and value people and recognize and act on their contributions. Create an environment in which people have interesting work and enjoy their coworkers. You're all human beings with complex emotions, needs, interests, outlooks, viewpoints, and dreams. Share something about yourself to create an environment in which your coworker wants to share information with you. Listen and don't pry. Polite and continuing interest in your coworkers contributes to workplace harmony. You have family and other interests outside of work. Hear what your coworkers tell you about their personal lives. Remember the highlights to demonstrate respect and interest. You have similar needs from work as demonstrated above in "The Human Capital Edge". Acknowledge this and note the commonalities. Work is more exciting when you feel as if you are accomplishing mutual goals. Act as if you are part of a winning team. Emphasize, with coworkers, your common interest in your success and the success of the organization. Note that all of you want to feel as if you are contributing to and part of something bigger than yourself. You'll get to know people as people if you participate in any fun or team building events your organization sponsors. Better yet, for the best mileage, join the team that plans them. Make opportunities to interact with your diverse coworkers. Schedule cross-department lunches. Take a new team member to lunch. Ways of interacting with diverse coworkers are only limited by your imagination. If you start by recognizing the ways in which you are similar to your coworkers, you'll build a base of understanding and acceptance that will withstand the sometimes stormy times when your differences in opinion, approach, or needs come to the forefront. Trust that it's truly worth the investment.